1 What is the Friends Tavern? What is the Friends Tavern? If you've only started playing, you will notice a ruin along a river to the north of your city. 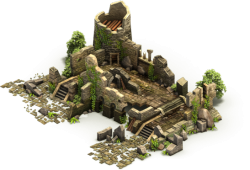 Once you unlock the Construction research in Bronze Age, this will become a functional building - the Friends Tavern. Your Tavern will come with its own interior, a small table and a few chairs. All your ingame friends can visit your Tavern and sit at these chairs if they are empty. Whenever there are friends sitting at your Tavern, you will be able to collect Silver and empty the table, making space for new friends to visit you. With this Silver you can activate various powerful boosts for your city or customize your Tavern to not only make it more appealing but also to increase your Silver income. You can visit the Tavern of every friend once every day. This can easily by done via the social bar - simply open your friends list and you'll find a button for visiting their Tavern (on mobile you will need to tap the player's avatar for this option). To be able to sit down in a Tavern of your new friend, you have to wait 24h for your friendship to become strong enough. To make sure that this limitation does not affect new players, it will only kick in once you have removed 20 people from your friends list. As you progress through the ages so will your Friends Tavern - it will change its appearance in specific eras! Your Tavern comes with a table for 4 chairs, but only 3 chairs are unlocked. The first chair gives you 50 Silver, and then it increments with +2 for every next chair. This means that when you collect your table with multiple players on it you will gain more Silver. But you need to keep in mind that if all your chairs are taken then other friends can't visit your Tavern. As mentioned you will find various upgrades for your Tavern which you can purchase using Silver (or Diamonds if you do not have Silver - the cost in Diamonds is 1/2 of the Silver cost). Here is a list of those upgrades, the effect they have, and their cost in Silver. Adds an additional chair at the table. Increases basic Silver income and the table size, giving the ability to buy a 5th and 6th chair. Increases basic Silver income and the table size, giving the ability to buy a 7th and 8th chair. Increases basic Silver income and the table size, giving the ability to buy a 9th and 10th chair. Increases basic Silver income and the table size, giving the ability to buy a 11th and 12th chair. Increases basic Silver income and the table size, giving the ability to buy a 13th and 14th chair. Increases basic Silver income and the table size, giving the ability to buy a 15th and 16th chair. Updating the Tray will give you a % increase on the Silver you collect from visiting friends at your Table. Updating the Table Cloth will add a chance that your Friends who sit at your Tavern can find a Forge Point. Updating the Floor will increase the potential coin you can receive when you sit down at the Taverns of your friends. Here is an overview of these customization upgrades. As with other upgrades if you don't have the Silver you can pay in Diamonds at half the Silver cost. +0% Tavern Silver upon collecting from your Table. +2% Tavern Silver upon collecting from your Table. +4% Tavern Silver upon collecting from your Table. +6% Tavern Silver upon collecting from your Table. +8% Tavern Silver upon collecting from your Table. +10% Tavern Silver upon collecting from your Table. 0% chance for Friends who sit at your Table to get a Forge Point. 1% chance for Friends who sit at your Table to get a Forge Point. 2% chance for Friends who sit at your Table to get a Forge Point. 4% chance for Friends who sit at your Table to get a Forge Point. 6% chance for Friends who sit at your Table to get a Forge Point. 8% chance for Friends who sit at your Table to get a Forge Point. 20% chance to find 5 Silver when sitting at the Taverns of your friends. 20% chance to find 10 Silver when sitting at the Taverns of your friends. 20% chance to find 15 Silver when sitting at the Taverns of your friends. 20% chance to find 20 Silver when sitting at the Taverns of your friends. 20% chance to find 25 Silver when sitting at the Taverns of your friends. 20% chance to find 30 Silver when sitting at the Taverns of your friends. You have to unlock these customization upgrades in linear form, meaning one by one - you can't jump from no table cloth to a royal table cloth, for example. But once you have unlocked them you can freely choose which one you want to use! With the Silver you collect you can activate powerful boosts that offer a wide variety of effects, like coin & supply boosts, fair merchants that trade goods with you in the market, a city shield that protects you from aggressive neighbors, and more! These boosts are all temporary, each having a specific duration. At any given time you can have just one boost active. You can open another slot that allows you to have two boosts active at a time at the cost of 50 Diamonds. You would need to open this slot whenever you're running a new boost and you want to start a second boost. Some of these boosts will be only available after you have bought a specific number of chairs in your Tavern. As the name might tell you, this first group of boosts are ones that affect your resources in the game. These boosts will work as an addition to any existing boosts you may already have (for example if you have a 100% coin boost from St. Mark's, and a 20% coin boost from the Tavern, you will get a total of 120% coin boost until the Tavern one expires). Boosts all your coin collections in the city by 20%! Boosts all your coin collections in the city by 40%! Boosts all your coin collections in the city by 60%! Boosts all your supply collections in the city by 20%! Boosts all your supply collections in the city by 40%! Grants you 1 extra turn in the Guild Expedition negotiation game! Makes your city population enthusiastic even when you have not reached the happiness demand! Grants you a 1:5 ratio for all trades with the merchants! Grants you a 1:4 ratio for all trades with the merchants! Grants you a 1:3 ratio for all trades with the merchants! The military boosts will be added to your army just like boosts from Great Buildings. When the attacker boost is active it will have an effect to your attacking army anywhere it is used (PvP, GvG, GE, or Continent Map). The defender boost will have an effect on your city's defending army (PvP). Grants your attacking army a 10% boost on their attack values! Grants your attacking army a 20% boost on their attack values! Grants your attacking army a 30% boost on their attack values! Grants your defending army a 10% boost on their defense values! Grants your defending army a 20% boost on their defense values! Grants your defending army a 30% boost on their defense values! Grants you a shield that prevents other players from attacking you! These boosts will help you speed up things in the game! Once you activate the construction boost, newly placed buildings will complete their construction faster. The recruitment boost will make the production of units from military buildings faster (it will not work on Alcatraz though). Speeds up construction of newly placed buildings during this time by 25%! Speeds up construction of newly placed buildings during this time by 50%! Speeds up construction of newly placed buildings during this time by 75%! Speeds up the recruitment of units started in this period by 15%! Speeds up the recruitment of units started in this period by 25%! Speeds up the recruitment of units started in this period by 35%!